I don’t have a tattoo, but I admire them on others, done right. I imagine that if I were younger or bolder (or both), I might even get one. But recently I’ve begun to notice an interesting (and disturbing) phenomenon when it comes to body art. It’s a sad fact of life: as we age, our skin sags (due to things like weight fluctuation, collagen loss and sun damage), and sometimes takes down the tattoo with it, stretching it out to resemble a flower wilting on the vine, or the famous Salvator Dali’s painting of the melting clock. 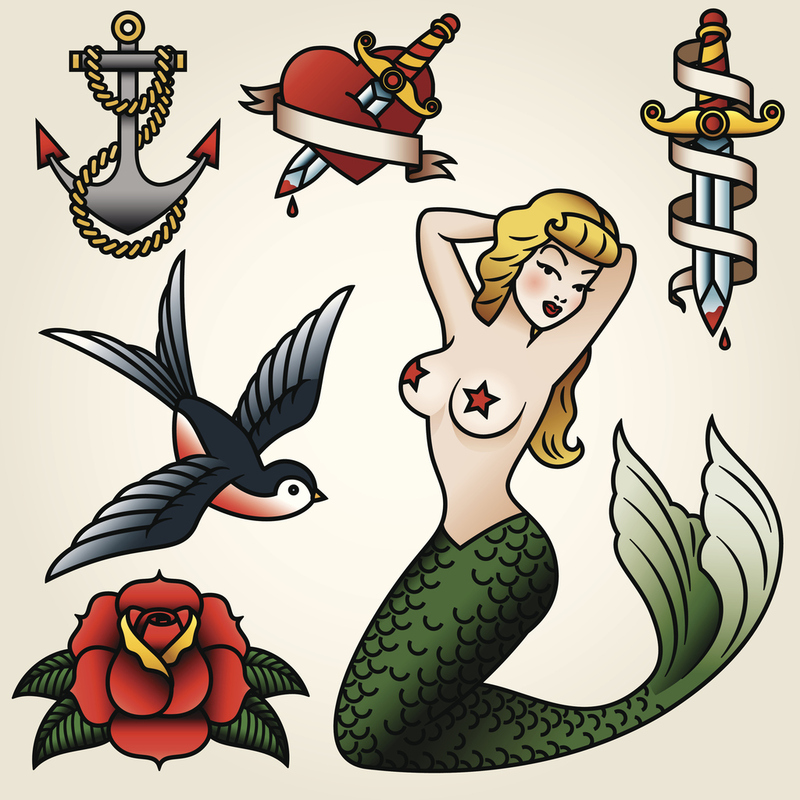 So, if you’re contemplating a tattoo and want to preserve it as you age, you’re best served by finding a spot on your body that is the least likely to sag, like the inside of the forearm, the back of the neck, the upper outer areas of your chest or the center of your lower back. Or perhaps you already have a tattoo and have fallen out of love with it. Maybe you thought his name emblazoned on your shoulder – and the relationship – would last forever. Maybe the body art look is no longer “you” and you find yourself covering it up rather than flaunting it. With regret, comes hope: Tattoos can be removed by a skilled dermatologist trained in tattoo removal. Apparently, there are lots of people out there with cases of tattoo regret; the American Society for Aesthetic Plastic Surgery (ASAPS) reports 37 percent increases in tattoo removal in 2015. 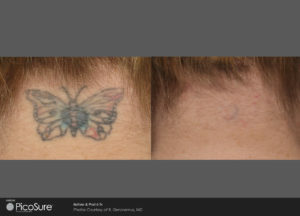 One option is laser removal, they report, where pulses of high-intensity laser energy pass through the skin and are absorbed by the tattoo pigment. The pigment is broken down into smaller particles which then are either metabolized or excreted by the body or transported and stored in lymph nodes and other tissues. Just as the FDA oversees the inks and pigments that go into tattoos, so do they regulate the laser devices used to remove them, and has approved several types for both lightening and removal of tattoos. Picosure is one type of laser used for this purpose (it can also be used to treat acne scars and wrinkles). It works with minimal discomfort and downtime and generally requires between three to four treatments (for most patients), which cost between $400-$600 each. It’s important to note that certain ink colors are easier to remove than others, since ink absorbs different wavelengths of light. Lighter colors – like green, red and yellow – are the toughest to remove, while blue and black are the easiest. When it comes to lasers, every patient experiences pain differently, depending on their threshold. The feeling is generally described as the skin being snapped with a thin rubber band. A couple of other options (though extreme and painful in my opinion) are dermabrasion, where the top layer of skin is “sanded” away; or excision, where the area of the tattoo is cut out and the skin then sewn back together. Wouldn’t it be nice if you could just order a cream or ointment and remove your tattoo at home? Sorry, you can’t. Well, technically you can – they are available online – but the FDA, who has not reviewed them, states that there’s no clinical evidence of their efficacy, and they may result in reactions like burning or scarring, rashes or changes in the skin’s pigmentation. You may have loved your tattoo at one time, especially that drunken night when you boldly had the words, “I am woman, hear me roar” inked across your upper back for all of eternity. The passage of time can do unexpected things to our bodies and our minds; making our roar a bit less fierce, or our message a bit less urgent.